You can have a drink from my water bottle if you help Mommy type your name, I say with a patience that is usually long gone by 8:51pm. Free access to my water bottle is big time. And slowly, together we found each letter and made a small symphony of sound with the tapping of the keys on the keyboard. Sweet music. Greyson repeated the sound of each letter after I did with beautiful clarity. Little light bulbs daily, Friend. That's all it takes. I will never give up. If you are a Teacher, you are awesome. Thank you for your help and patience and commitment. We couldn't do this without you. A few years ago I worked for Pfizer doing pharmaceutical sales. I had an evil boss--let's call her Roxanne- because that's her real name. She harshly criticized every move and every choice I made. Nothing was off limits, including the boys I dated and my religious preference. TRUE STORY. When you work in pharmaceutical sales about once a month your boss rides with you for two days in a row, witnessing every exchange with every physician. Every night before a ride along with Roxanne I would be in tears frightened about the days that were to come. Her list of grievances were lengthy.You are not giving away nearly enough samples. The more you leave, the more they will use. Leave them everywhere.The company spends 18 million on samples and they are what gets you in the door. You didn't close the doctor hard enough. You need to get his commitment to use Detrol LA vs the competitor on his next 10 overactive bladder patients. You should have read the entire conclusion on the overactive bladder clinical study mentioned in the package insert. And I believe you said it was published in JAMA in 1993. You didn't mention the month. And you were joking too much with the physician, it absolutely ruins your credibility. You come across like you aren't smart. And that purse- is that usually your weekend purse, or do you use it all the time? It's a little on the casual side- don't you think? And Roxanne would casually pull down the sun visor mirror and reapply her lipstick like she was an actual human being, oblivious to the soul she had heartlessly crushed out like an old cigarette. One day I finally said something. I'm really motivated by positive words, and doing a good job is really important to me. If you could also share with me the things I am doing well, it will really help me do the best job I can. Well, if you would start doing things well, then I might have something positive to share with you, she said matter of factly. Quitting that job was one of the greatest days on Earth. I practically sang my resignation to her. My next boss was nothing like Roxanne. After every call, he would bring up the things I did that he liked. He liked my straight forward, yet casual approach with my physicians. We would have fascinating medical discussions about our product and the disease state in between calls. He ignited a fire that made me want to learn more, share more, know more, do more. He empowered me in ways that trickled over onto my every day life. He expected a lot from me- and I performed because I didn't want to let him down. He let me be a real person, not a sales robot. Sometimes he would say, You're doing such a great job. If I could just clone you I would. And yesterday after taking Parker to preschool I suddenly thought of this boss and his approach of focusing on people's strengths. I thought of how it felt to be beat down by Roxanne. Picked apart. Mistrusted and scrutinized. I thought of how that affected my performance. And another little light bulb went off in my head. I will focus on my boys strengths. In therapy and in life. I see what they like. I see their strengths. In therapy, instead of focusing on what they don't do- we will also focus on what they are amazing at. When it comes to the boys- sometimes I have this blessed peace of mind that just maybe I am doing some things right. Joan of Arc is pure amazing. She said, I'm not afraid, I was born to do this. That's how I felt all day today in regards to taking care of my boys. That never happens. I need to channel Joan of Arc and feel like that more. Have you ever seen the Jane Elliot experiment? It blows my mind every time I see it. Please watch it. Over 30 years ago, in response to the assassination of Martin Luther King, Jr, Jane Elliott devised the controversial and startling, Blue Eyes/Brown Eyes exercise. This, now famous, exercise labels participants as inferior or superior based solely upon the color of their eyes and exposes them to the experience of being a minority. In this youtube clip, the original students are watching the footage years later. It's the kind of thing you watch that stays with you. Watch it, it will change your approach on Life. Mrs. Elliott was so ahead of her time. She taught against the grain, and I'm sure she received flack for it. I think she's amazing. Her words still teach us to love everyone, regardless of our nouns. Black, white. Gay, straight. Autistic, typical. So often we perform based on others feedback, thoughts about us and expectations. What happens if those expectations are always assuming the worst? We each need to do our own part of continue Mrs. Elliott's message of equality. 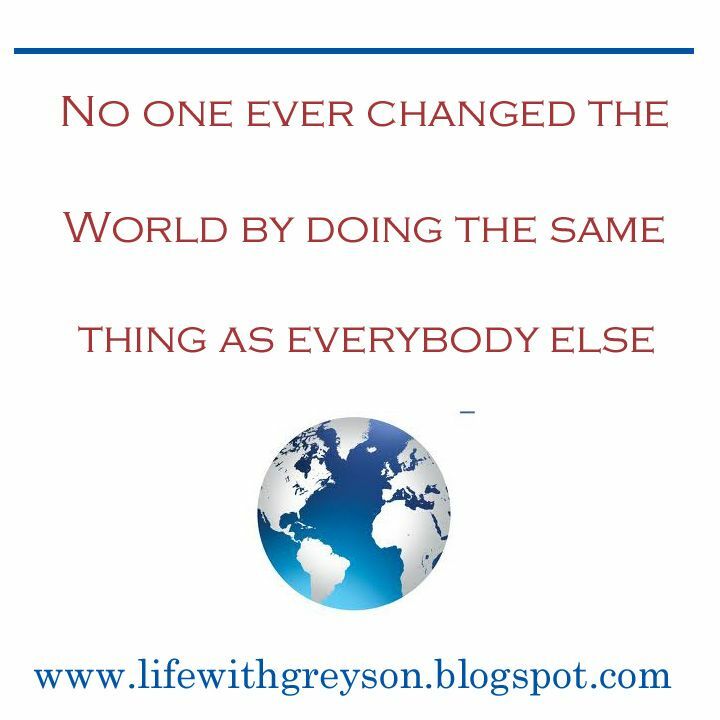 We all need to do our part to change our World. And just like I realized today. It must start within our own home. Maybe even a step before that--it needs to start in our own head first. Focus on your own strengths. And remember, empathy and acceptance is the cure to so many things. "Let's call her Roxanne- because that's her real name." Hahaha, funniest thing ever. Along with the overactive bladder questionaire. And yes, today I will focus on MY strengths and I will focus on others strengths. I am reading Temple Grandin's book "Emergence: Labeled Autistic" and I just came across these inspiring words from her mother: "There is nothing morbid or difficult for us in caring for Temple. And I don't feel sorry for us. It is frequently exciting and not uninspiring for it seems to bring out the best in people." I loved that, and I think it is so true. Have you seen this video? No, it's not spam, I saw it on Facebook and thought you need to see this. It's so wonderful. "I'm not afraid. I was born to do this." Yes! We all need to feel that confidence and empowerment! By the way, bad bosses are the WORST. It's so awful how they can affect our lives in ways they have no right to. I'm glad you recognized her insanity and found a better one! WOW....I have never seen this before. Thanks for sharing!!! Awesome video. Love you and your family. What a blessing! Here is a recent thing I realized - we often base our expectations on what has happened in the past but what if we looked at each time with an open minded / clean slate kind of attitude? I'm going to focus on strengths and try to embrace not knowing what is going to happen instead of subconsciously or consciously predicting it. For me, that is harder than it sounds but I'm going to give it a try.